You'll be £25.00 closer to your next £10.00 credit when you purchase From Sapper to Spitfire Spy. What's this? Good coverage of a pilot in a more unusual role. 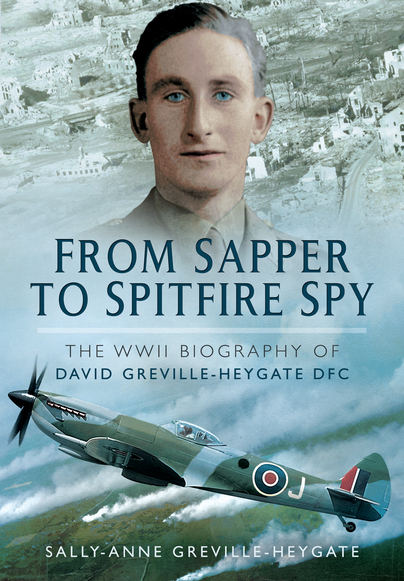 Using snippets from diary entries, letters, logbooks, squadron records, and other documents, the author has managed to construct an engaging history of a talented photo-reconnaissance pilot and the war in which fought. This is an utterly fascinating story of an extraordinary man. The role of the photo reconnaissance pilots is often forgotten, but operating behind enemy lines with no protection but the speed of the aircraft and their own flying skill, these men were certainly very real heroes. This is a wonderful testimony to a very courageous man. Called up by the army in August 1939 David Greville-Heygate operated a searchlight until commissioned at Sandhurst. Posted to the Loyals in Portsmouth he had ‘a bit of a row’ with his Brigadier and labelled an Army Rebel. After training as an Army Co-operation pilot he flew No. 16 Squadron Lysanders and Mustangs. Photographs he took of Northern France were used to plan the D-Day landings. Later, declared unfit for high flying, David worked as an instructor until December 1944 when he was posted to Holland to fly Typhoons with No.168 Squadron. A lucky break saw him transfer to No.2 Squadron and for the rest of the war David flew photo-recce Spitfires recording German troop movements. Sally-Anne Greville-Heygate is the daughter of David Greville-Heygat. She is a professional photographer, using snippets from diary entries, letters, logbooks, squadron records and other documents, she has managed to construct an engaging history of a talented photo-reconnaissance pilot and the war in which he fought.